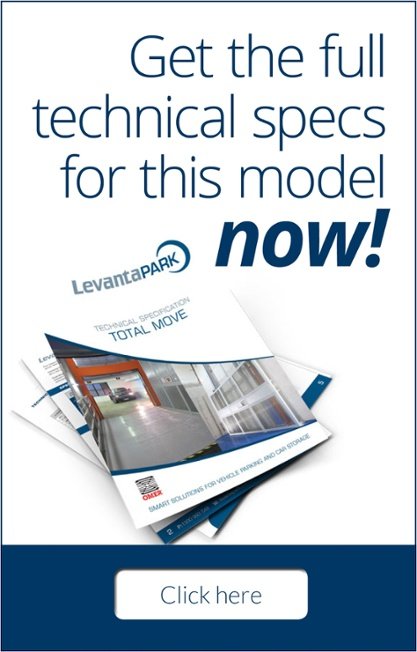 Totalmove is the top of the LevantaPark range, delivering outstanding performance both as a car parking lift and a goods lift. Incorporating all the benefits of the rest of our range, it’s capable of carrying great capacities (up to 3 tonnes) to a great height (up to 16 metres). What’s more, Totalmove can carry a person on board the vehicle in complete safety. Totalmove can travel up to 11 metres with a person on board the vehicle. 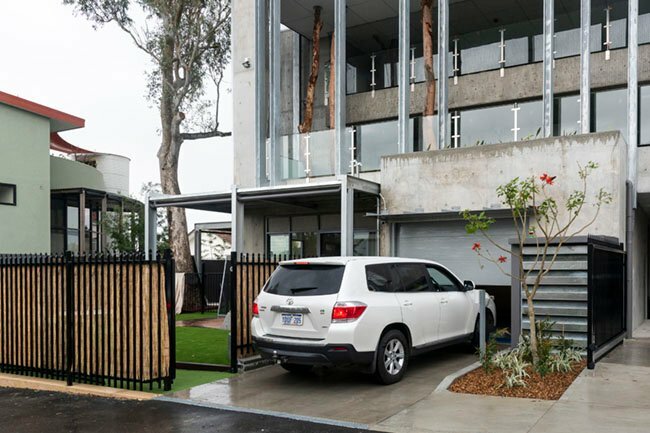 Totalmove’s platform has a 2.5 metre high guard which can only be removed using special maintenance tools. This solution prevents accidental contact with the moving parts of the platform. The on-board operator control panel houses all the push buttons for operation and platform safety, as well as the intercom which is connected to a telephone dialler holding seven numbers in memory for repeat dialling. 22 included country codes make the Totalmove unit easy to adapt to national telephone networks. To ensure the vehicle is always correctly positioned, the platform’s short ends have photoelectric barriers composed of two photocells. This system blocks the Totalmove unit from moving if the vehicle on-board moves abruptly or risks bumping against the wall during operation. The easy-to-install electric and hydraulic connections are located in the pit under the platform, between the two columns. Totalmove’s column is secured to the wall using plates pre-welded to the column and chemical anchors. The photo also shows the lift chain and pulley connection. A guard on the outside of the pulley prevents the chain from leaving its seat. A system of limit switches at the base of the piston controls the tension of the lift chains (two per piston), and ensures that the platform is locked in case of malfunction or if one of the chains should fail. This photo shows the limit switch positioned on the unit. This photo shows the deceleration and travel regulation limit switch in action, highlighting the length of the operating cam (longer than the stop cam). This photo shows the operation of the stop limit switch, located on the column opposite the deceleration limit switch, and highlights the shorter operating cam. 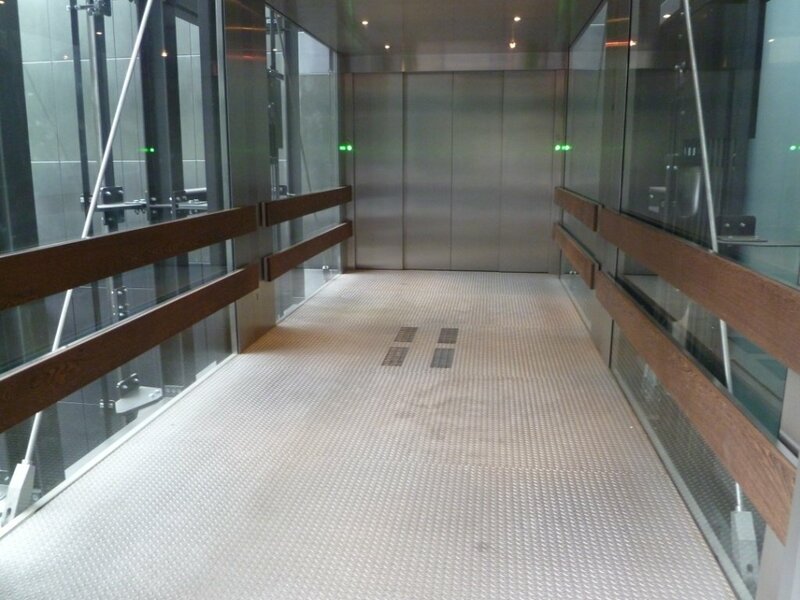 These photos show the mechanical assembly that hydraulically locks the platform to the floor. The shoulder of the platform passes beyond the point where the piston is mechanically blocked to the floor, thus allowing it to protrude. The piston that mechanically locks the unit to the floor is further controlled by an “all out, all in” limit switch that analyses the correction position. This photo shows the column with the lift cylinder rack with torsion bar, catenary protection of the power cables on-board the platform, and the electrical junction box. The unit has a torsion bar system that engages the two racks fixed to the sides of the two columns. This system makes it possible to distribute the weights over the platform, even if they are off-centre, thus making it possible to use the lift for goods as well as vehicles. From below you can see the various elements that stiffen the platform, ensuring that it is rigid and cannot bend, even with side or off-centre loads.